At 7pm there was a general meeting of ship-owners, ship-masters, and others interested, held in the Town Hall to memorialize the Board of Trade as to the most suitable site for the erection of a lighthouse to guard the mariner from that most dangerous of rocks called the Stones at the entrance to St Ives Bay. So wrote John Tregerthen Short of St Ives in his diary entry for 3 February 1857. 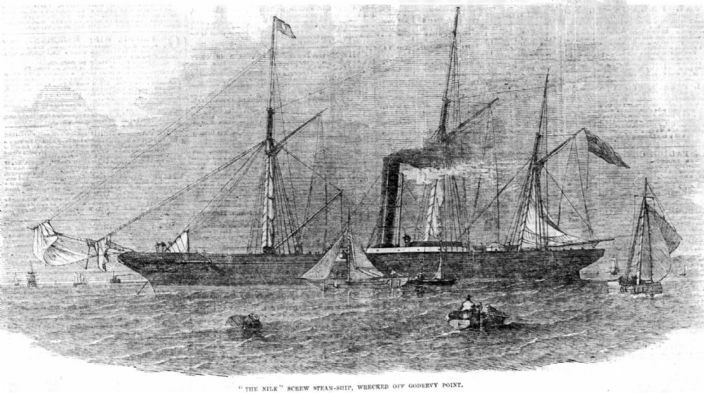 The Stones had seen many wrecks and much loss of life in the years immediately preceding the 1857 meeting: 27 February 1840, brig Robert sunk after hitting the reef; 9 April 1848 a schooner ran onto the reef with the loss of the ship and one man; 28 April 1852, the Hope, smack of Salcombe foundered on the Stones on passage from Newport to Totnes; 11 March 1856, Desdemona ran onto the reef but managed to get off again and had to be towed back to Cardiff; 22 March 1856 brig Ernest became the fourth vessel in six weeks to be wrecked on the Stones; 29 July 1858 brig Mary Welsh lost on the Stones with all her crew. These are just some of the tragedies to take place in the 1840s and 1850s but the event which did most to bring the issue to wider public attention was the loss of the SS Nile on 30 November 1854. The Nile was a four year old iron-hulled, sail assisted steamer, a cargo ship with passenger accommodation. She hit the Stones at night in bad weather with the loss of all hands and passengers, about 40 people in all. The fate of the Nile became clear when papers addressed to the skipper were washed ashore at Portreath, followed by several bodies, including five women, coming ashore at Tehidy.